Papa Wheelie continues his Formula 1 2012 season preview. In the last post, we took a look at where the top teams were in their pre-season and went over a bit of the news from the off-season. Now let’s take a look at where the midfield and new teams stand going into 2012. In a late development, and following some vast speculation that Robert Kubica would not return for the 2012 season, Lotus Renault decided to do a clean sweep of all their drivers and bring in 2007 world champion Kimi Räikkönen and former GP2 and Renault driver Romain Grosjean. Lotus Renault had an innovative car for 2011, but it ultimately proved uncompetitive, and led to a weak performance by the squad. Early signs show that this year’s car is much better than last year’s, and the drivers seem to be adapting well to their new team. 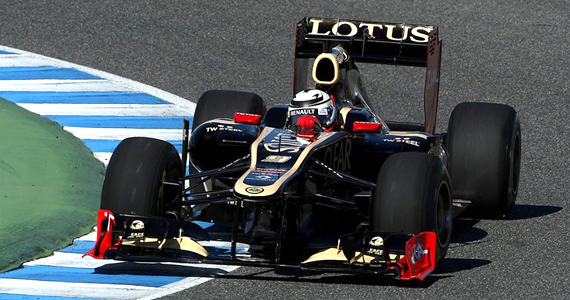 Lots of pressure is on Räikkönen now to lead the team, as well as fill Robert Kubica’s shoes. If anyone can do it, it’s Kimi. And, at 32 years old, he’s still got quite a bit of seat time left in him. Look for some good action from these guys. Force India was clearly the class of the midfield cars in 2011. Great drives by Paul Di Resta and Adrian Sutil were well deserved and showed that this team is starting to show real promise. 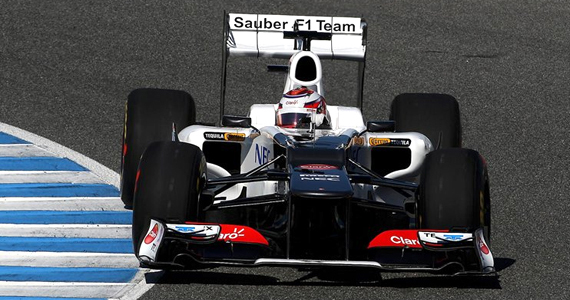 For 2012, Sutil has been replaced by former Williams driver Nico Hulkenberg, and the team has already shown good pace in pre-season testing. They are clearly looking to have a breakthrough year and join the top teams in the paddock. If the car is there, the drivers are poised to score good points and have a great year. Despite having a very strong start to 2011, Sauber’s performance and development fell flat in the second part of the season. 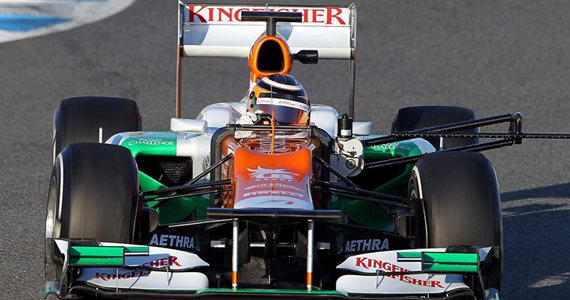 Kamui Kobayashi and Sergio Perez showed very well in 2011 and look to continue their growth in 2012. Initially the car looks pretty much like an evolution of last year, but with the key changes to conform to the new rules, as well as some innovative solutions to the new regulations. Occasionally leading testing has showed that they are making progress, but it’s very had to see just how much at this point in time. New management for 2012 spells new innovation, and could spell new problems as well. Again if the car is there, they are likely to take better advantage of it then some of their rivals. Scuderia Toro Rosso is coming off a somewhat erratic, but otherwise successful 2011. Although they were strong midfield contenders, they never really broke through to fight for the podium, which ultimately caused the team to choose an entirely new line-up for 2012. 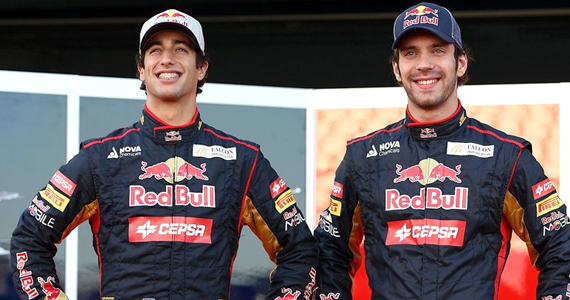 Up from a decent drive in HRT in 2011, Daniel Ricciardo has joined STR amid much speculation that he is on the fast track to become Sebastian Vettel’s teammate in 2013. Jean-Eric Vergne also debuts for STR after showing very well at post-season testing in 2011 and having a great season in the Formula Renault 3.5 series (better than teammate Daniel Ricciardo [5th] and American Alexander Rossi[3rd]). 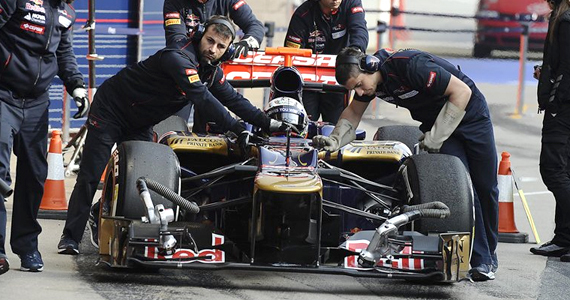 Pre-season testing has been strong for STR and they could be looking at possible breakthrough year for 2012. 2011 was definitely one of the low points for Williams. One of the most fabled marquees in F1 struggled, only managing to score five points for the year. They had severe reliability issues and managed only a handful of good performances. Although outscoring his teammate for the year, Rubens Barrichello was dropped for Bruno Senna and Pastor Maldonado retains his seat. 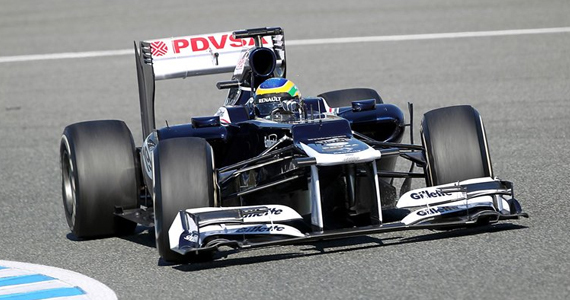 Williams really has only one way to go from their 2011 season, but the newer teams are starting to find their footing in the sport, and could easily begin challenging Williams if they don’t develop their car better. Formerly Team Lotus (and finally settling the whole naming dispute over the term “Lotus”), Caterham is steadily making progress on their car and in their design technique. 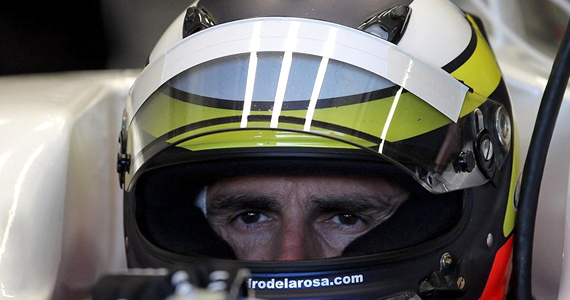 Jarno Trulli has been dropped for ousted Lotus Renault driver Vitaly Petrov. He and Heikki Kovalainen head the charge for Team Caterham in 2012. Pre-season testing has been mixed for the team, but ultimately, the car looks like it’s moving forward. 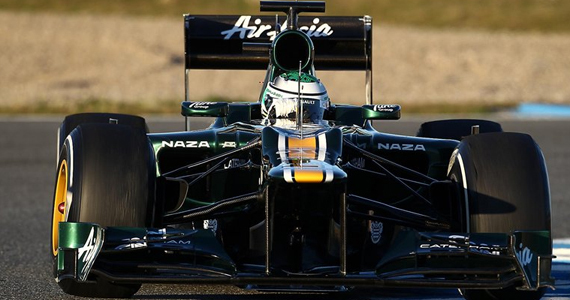 Caterham has set their goal of scoring points this year, and even breaking into the top ten teams for the first time. The team is relatively solid, so I wouldn’t be surprised if they do have their first big breakthrough this year. Narain Karthikeyan and Pedro de la Rosa begin what looks to be another tough year for HRT. The new car hasn’t broken cover yet and has been set back by failing crash tests and other problems. With no real testing until the first practice at the first race, HRT has a lot of work to do and it’s hard to believe that they are going to be ready to fight with Caterham any time soon. 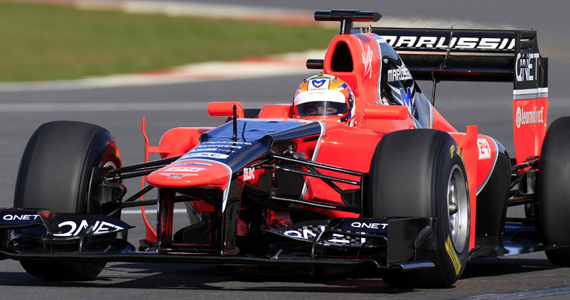 Marussia is another team who is behind the eight ball going into the first race of the season. Late development, and failing to pass the mandated F.I.A. safety crash tests on their new chassis, also means that the team will truly be shaking down and testing their new car at the first race in Melbourne. Timo Glock returns for another year and is hoping for better results than in 2011. Charles Pic is the third French driver on the 2012 F1 grid, and is looking to both get some good experience and show that he has some skill that will ultimately get him on a better team. Marussia was in the running for being the slowest team through the last part of 2011. The team has a mountain to climb if they are going to start moving in the right direction. With eight different drivers and almost as many teams leading throughout pre-season testing, it’s much more difficult to determine where everyone stands with their pace this year. Hopefully the regulation changes have brought the teams closer together, and ultimately will translate to more on-track action, and more opportunities for younger drivers to mix it up with the world champions. Everyone will be looking to de-throne Sebastian Vettel and Red Bull Racing, and many drivers such as Mark Webber, Felipe Massa, and Michael Schumacher are likely racing for their careers this year and will be very hungry to put in some great performances. Many questions will be answered in Melbourne today, so get ready for the return of F1!